To save you the trouble I’ve scoured all of the live casinos I promote to find the best promotions for live casino players in January 2019. This is by no means all of the live casino promotions you’ll find online. But these are the ones being offered at the casinos I know and trust. So lets kick this off. Date of promotion – From 6th until the 24th January 2019. Details – Play on the Leo Vegas Live Roulette table between 16:00 – 22:59 from Sunday to Thursday each week to have a chance of winning up to £150 in Cash. Just get a winning straight up bet on one of the magic numbers 3 times to win £50. There are three each day to choose from. You have to be 18+ and have selected YES to promotions in your account. Terms & Conditions Apply. www. begambleaware.org. Details – It’s actually two promotions in one. One for Blackjack players and one for Roulette players. Place a straight up Bet on 17 and if it wins you get £10 cash on top of your payout. You can claim this 5 times during January. Blackjack Players will get £10 cash for every 10 Blackjacks you get on any Netent Live Blackjack Table . A max of five claims can be made during the month. £5 minimum bet applies to both. 18+, Terms and Conditions apply, www.begambleaware.org. Details – You’ll need to opt in. Play on any of the Pokerstars live Blackjack tables. You need to collect 12 puzzle pieces a day to be eligible for a $10,000 cash prize. Each of the 12 puzzle pieces is a card from a deck of playing cards. (my puzzle was the KQJ of each card suite). If you’re dealt the card it gets crossed off the list, whether you win lose or draw. When you’ve completed the puzzle you’ll be awarded a Random prize up to $10,000. You need to be 18+, Terms and Conditions apply, www.begambleaware.org. 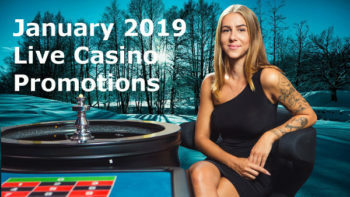 Date of Promotion – Every Tuesday during January, February & March 2019. Details – You need to opt in for the Promotion. Play a minimum 10 rounds of Blackjack and get 25% cashback on your losses up to £25. Minimum Cashback is £5. Losses less than £20 do not qualify. Only Cash wagers contribute . Cashback credited to your account within 48 Hours. Terms and Conditions Apply, 18+, www.begambleaware. Blackjack Prize Card – Win a Mystery Gift. Date of Promotion – 3 pm – 4 pm Monday to Friday. Details – You’ll need to Opt In. Play on The Evolution Live Blackjack Table. Get dealt the prize card, win a Prize. Only open to UK players, only one prize per player per day. 18+, Terms & Conditions Apply, www.begambleaware. The pick for me has got to be the Pokerstars mystery prize puzzle. If you’re in for a bit of a session you should be able to collect all the pieces of the puzzle. Who knows you could be the one to win the $10,000.